BOOM! Studios newest imprint, BOOM! 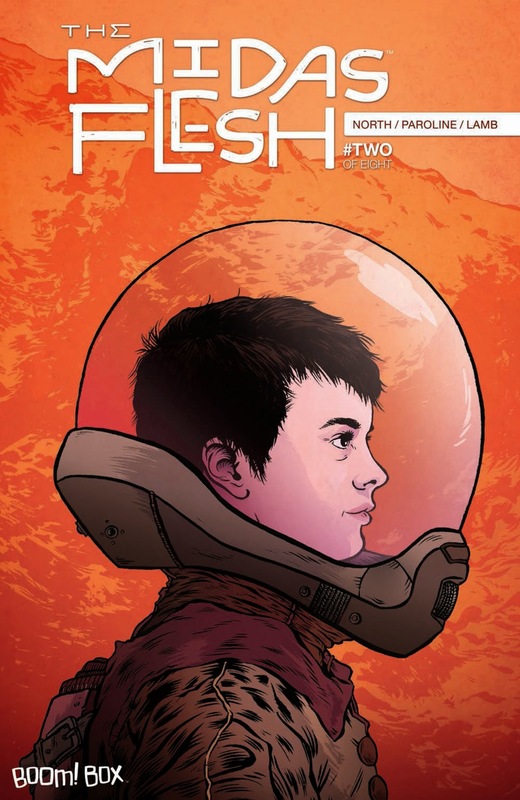 Box, is back with their debut title,The Midas Flesh #2. In The Midas Flesh #1, readers were introduced to the crew of the Prospect (consisting of Captain Joey, Fatima a.k.a. Fatty and Cooper), the mystery of the solid-gold Earth and the Federation, the still enigmatic galactic force. As stated in my first review, give credit to Ryan North for pacing. The issue flows well, especially while depicting different tones at times including plenty of humor. Having done the setup in the first issue, he opens up the characters a bit here. Most of that attention is given to Cooper. North dedicates several pages to revealing an impactful moment in the Utahraptor’s life. Besides developing the character, it adds that other layer to the book in terms of tone. Shellie Paroline and Braden Lamb pick up right where they left off with the first issue. They complement North’s narrative well. Their storytelling skills are well displayed. This is quite evident during Cooper’s flashback sequence. From the crew of the Prospect to members of the Federation, the characters exhibit a wide range of expressions. The segments where Fatima expresses her boredom are memorable. The color palette may be the most noticeable visual. The brighter colors throughout the issue give it an animated look. The Midas Flesh #2 exactly what you want in an all-ages book. The narrative isn’t too complex for younger readers while not being watered-down to turn older readers away. Combined with the inviting visuals and you have an all-around fun comic standing out among the grittiness of other books. This copy of The Midas Flesh #1 was provided by BOOM! Studios.